Their 2-day journey will take them to Las Rozas in Madrid where they will congregate along with other leading futsal coaches and instructors from around the world who are there to attend the program. The seminar will open on May 9 and will span over 5 days closing on May 13. Sam is travelling as the delegate for the Oceania Football Confederation (OFC) and will be speaking on matters relating to futsal development in the region. He was selected for the trip after the OFC futsal development officer left his position earlier this year. 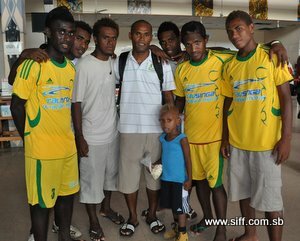 Waiia, who was the coach that took Solomon Islands to its first FIFA Futsal World Cup, represents SIFF and his travel is made possible by funding from FIFA which has paid for delegates from its member associations to attend the seminar. Sam says that he is very privileged to be selected to attend the FIFA seminar and is looking forward to sharing experiences with other delegates. “I carry some responsibility with me to the seminar as the OFC representative as I need to make a strong impression for our confederation. At the same time I feel very fortunate on a more personal level because this opportunity gives me first hand interaction with some of the top futsal people in the word,” says Sam. However, Sam’s attendance comes at a cost since he will not be with the national futsal team in their crucial final week of preparations for the OFC championship which kicks off on May 16. “It is quite an important time as we head to the OFC championship and I will not be with my boys but I am sure that they are in fine hands with our head coach and most of hard work has already been done. I also think that some valuable lessons will come from the seminar that might be helpful for the team,” Sam says. Waiia also shares the sentiments of his colleague and says that he sees the seminar as an avenue to promote the potential for futsal in Solomon Islands and the region. “I am sure that my colleague and I will get the message across that futsal has a big future in the pacific. Our mission is to let them know about this and take back with us the positive experiences of other countries to help us grow the code here,” says Waiia. General Secretary of SIFF, Eddie Ngava, says that the pair are the most appropriate persons to attend the seminar because of their work at the ground level. “Waiia and Sam have on the ground experience and their work will put them on the front line in developing futsal, hence, their attendance is of great importance to the Solomon Islands and the region,” Ngava says. Sam will be joining the national futsal team in Fiji when he returns while Waiia will be heading straight home.